Volunteerism — Volunteerism refers to an act involving a wide range of activities, including traditional forms of mutual aid and developmental interventions that provides an enabling and empowering environment both on the part of the beneficiary receiving, and the volunteer rendering the act, undertaken for reasons arising from socio-developmental, business or corporate orientation, commitment or conviction for the attainment of the public good and where monetary and other incentives or reward are not the primary motivating factors. Taken from the Philippine National Volunteer Service Coordinating Agency. And yes, we actually have an agency that is centered on volunteerism. Isn’t it great? Volunteers can work with the PNVSCA which is the agency that coordinates volunteer service programs for national development. Agencies that work with the PNVSCA to send skilled volunteers abroad include VSO Bahaginan. VSO Bahaginan is a development organization that promotes volunteerism. The organization recruits, trains and sends skilled professionals to work in partnership with organizations in Asia, Africa, Latin America, the Caribbean and the Pacific. They manage and develop business partnerships with companies who release their employees on short-term volunteer placements. 1. They want to make a difference. Volunteers come from different backgrounds, culture and social classes. But they have one thing in common, they want to make a difference. They want to leave a mark. 2. They want to learn and they want to teach. People who volunteer want to share their skills. Many also want to learn about the community that they are trying to help out. 3. They are following their calling. As Happy of VSO Bahaginan said, there are professional volunteers. Professionals (doctors, engineers, architects, teachers etc) who make volunteerism their career. I believe because they feel that this is their calling. 4. Because other communities need them. Their desire to volunteer stems from the very fact that they are needed in marginalized communities. Ask and you shall receive. VSO Bahaginan: Through volunteering, people – including the poor and marginalized – can participate in the transformation of their communities. We support organizations, programs and advocacies that promote volunteering for development. We do this by developing products and delivering training to help national volunteering partners to practice good volunteer management. We involve young people and give them a chance to make a real difference in their exchange communities. VSO UK: Volunteering means that you have the chance to really make a difference to the way that others work, for the rest of their lives. You also have the satisfaction of knowing that you have made a lasting impression – your contribution to fighting poverty and disadvantage lives on after you through the lives you touch. And by understanding others’ difficulties and dedicating time to tackling them together, you gain new skills, witness fresh approaches to all sorts of situations, and acquire greater confidence to draw on in the future. Volunteering truly is an amazing feat! One day, I hope to be a full time volunteer. There is just so much to experience in life and I am certain volunteerism can provide us an amazing journey. For more information on volunteering please visit http://www.vsobahaginan.org.ph/. For those of you who cannot volunteer but want to help VSO’s volunteers, you may donate through this channel: http://www.vsobahaginan.org.ph/donate/. Or you may also make a difference by joining VSO fundraising events just like the upcoming VSO Kabahagi Run 2010. Registration Fee includes singlet, race bib, race packet and accident insurance. 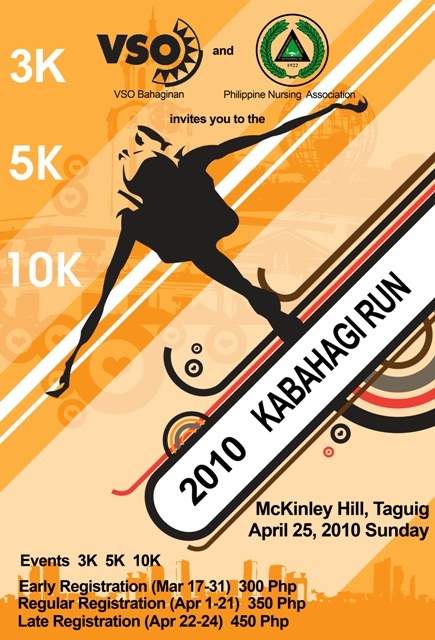 This event is organized by Leadpack (RotaRun09, The Green Mile, Takbo.ph RunFest). Make a difference, join now and help VSO Bahaginan volunteers! i want to apply as volunteer as Agriculture Specialist. Im an Agriculture Tech. employed at Local Government Unit of San Miguel, Bohol, Philippines for about ten years. Hi Marcela, thank you for your interest. Please do email me your contact details and I will forward this to VSO Bahaginan. My email add is gail.consolacion@gmail.com.